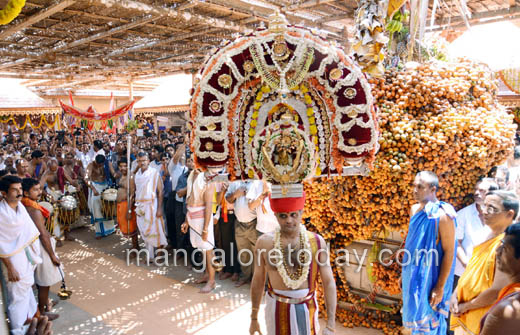 Puttur 17 April 2015: The week long puttur Shri Mahalingeshwara annual jatra mahostva culminated with Brhma Rathostva and biggest ever crackers show in the history of puttur Bedi ustva, which is very famous in this region. 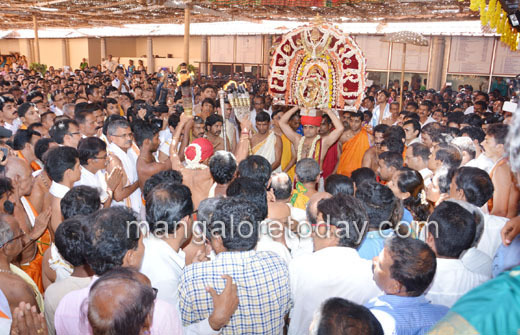 Lakhas of devotees thronged the temple throughout the day of car festival of Lord Mahalingeshwara on April 17 and newly concretised car street, which was offered by Don turned business man Muthappa Rai, who happens to be a native of Madavu in puttur taluk, was also inaugurated on the auspicious day. 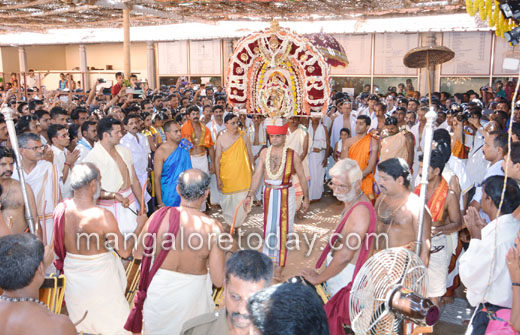 Sources told that this year special fire crackers show was organised and an equal part of expenditure was shared by Muthappa Rai as an offering to Lord Mahalingeshwara. Two years ago Rai, an ardent devotee of Mahalingeshwara, had offered Brahma Ratha and this year donated the expenditure of concretising the car street in front of the Mahalingeshwara temple. People from all religions including Muslims, chritians, Jains along with Hindu brethren witnessed spectacular car festival followed by magnificent cracker show. Dakshina Kannada district police has arranged an elaborate security and traffic management for the first time regulating vehicular traffic in every corner of the town under the leadership of SP Dr.Sharanappa and team. 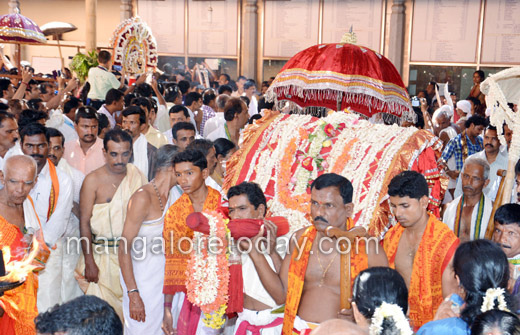 After the Rathostva, as per tradition Lord Mahalingeshwara will go for Avabhrutha snana – take bath – in a pond located at faraway place called Purushara katte. Before that, the presiding God will travel in length and breadth of the town and receive katte poojas in numerous places.